138 x 108 mm 134 pages, 18 Tables, color; 18 Illustrations, color; X, 134 p. 18 illus. in color. Featuring helpful examples and top tips throughout, this handy guide equips students with the tools to understand, respond to and apply lecturer feedback in order to continuously improve their academic performance. Chapters take students through the entire feedback process, from handling common feelings associated with feedback and making sense of criticism through to creating an effective action plan and applying feedback across their course. 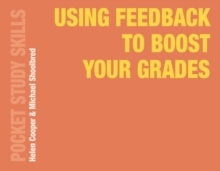 Using Feedback to Boost Your Grades will be an invaluable toolkit for students of all subject areas and levels who want to take control of their academic progress and make the most of the feedback they receive.